The Philips HeartStart XL Defibrillator, at just under 14 lbs., is easily transported anywhere cardiac care is needed. A combination manual device with automated external defibrillator capabilities, HeartStart XL enables the first caregiver on the scene, whether an ACLS or BLS clinician, to deliver lifesaving defibrillation therapy. Upon the arrival of ACLS personnel, HeartStart XL is easily switched from AED to manual mode, allowing operators to access the unit's advanced therapeutic features such as selectable energy (from 2 to 200 Joules), non-invasive pacing (optional), SpO2 (optional) and synchronized cardioversion. Impedance Compensation. Measures chest impedance and delivers a low-energy shock based on patient's unique physical requirements. Quick Charging. Charges to highest energy level, 200 Joules, in less than 3 seconds. Synchronized Cardioversion. Philips' SMART Biphasic waveform has undergone clinical testing, demonstrating its effectiveness for cardioversion of atrial fibrillation. 1-2-3 Operation. True 1-2-3 operation makes defibrillation intuitive for all users. AED Mode. Voice and text prompts guide users through the defibrillation process. 150 Joules non-escalating, pre-set energy level. Paddles (optional). Anterior/anterior adult paddles convert to pediatric by removing the outer contacts. Multi-function Defibrillator Pads. Adult and pediatric pads for defibrillation, ECG monitoring, pacing, and synchronized cardioversion. All patient data, including continuous ECG and events (i.e. shock and alarms), are stored in the unit's internal memory and on an optional data card. When used with the Philips CodeRunner Web data management system, users can edit, store, and print reports required for quality control and reporting. Grab and Go. Less than 14 pounds (6.35kg). Compact. Easily fits on a standard hospital stretcher. Rugged. Withstands the rigors of hospital use and patient transport. You Choose the Warranty. Five-year unit exchange (North America only), or one-year on-site service with extended warranty options, or 5 year BioMedical warranty (U.S. only). Dependability. 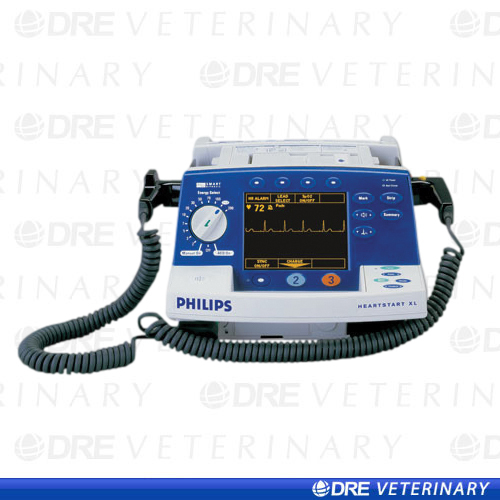 Part of the complete family of Philips resuscitation products used by healthcare providers for over 30 years.